Coins are the main currency in ChefVille. You will need coins to buy new equipment, supplies, decorations and also to unlock new areas. 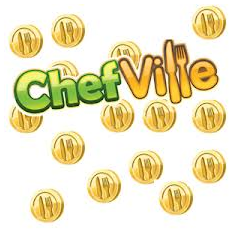 The more coins you get the faster you can gain experience and progress through ChefVille. #1. Serve Meals To Customers- Your waiter will automatically serve meals to customers. However when you serve customers you will receive extra coins. The only catch is that each time you serve a customer yourself it costs energy. If you have some extra energy and need some coins, serve customers is a great way to spend energy. #2. Complete Goals- You will always have goals to complete, shown on the left side of your screen. Upon completion you will receive ingredients, XP and Coins! Be sure to complete the goals that are set for you. #3. Help Out Friends- You can help out each of your ChefVille friends 5 times each day. Each time you perform an action at your friend's restaurant coins will drop for you. The more friends you have on ChefVille the more coins you can collect each day! #4. Buy Coins- You can also buy coins for Cash if you choose to. Cash can be bought for real money. I wouldn't want to spend real money on a game, but the choice is up to you. #5. While You Were Away- Customers will continue to be served by your waiter while you are away from the game. Make sure you make enough food for your customers for the time you are not playing ChefVille. You will receive the coins once you log back into the game. I hope these tips helped. If there are any other ways of getting coins please comment below. Thanks for reading!